Posted 7:15 pm by ENDURrun & filed under 2018. Time your race preparations with this projected start order. The 10 KM Time Trial (TT) starts one runner each minute, in reverse order to their seed time, which is determined from previous results and expected finish times. Dropouts and no-shows may still adjust the start times by up to 10 minutes from the Estimated Start Time – check in early. Participant check-in and Guest runner bib pickup is at the start line in Elmira. Shuttles of people to Elmira are available in Conestogo, and shuttles of gear back are available from the start line. Not since 2006 has the gold jersey been snatched at Stage 5. But that’s what happened today as Valery Hobson ran a strong personal best in slippery conditions. She picked up enough time on the final three laps to surge into a 7:00 overall lead. Robyn Collins raced for the first time at Chicopee and now finds herself in a jersey other than gold with 52.2km to go. Robert Brouillette and Aidan Rutherford extended their claims on the 1-2 spots, and Christian Belair leapfrogged his way into 3rd place today! Greg Dyce put in a strong performance (his 4th for H+P) as the Men’s A team continues to lead the standings. We lost two Ultimates today: Lisa was unable to start, and 1.5 loops at Stage 5 is Ken B’s new ENDURrun milestone. We hope to see you this weekend! Other EBs (“ENDURrun bests”) today include great performances from Ian, Nick W, Rebecca, Merlin, Ashley, and Chris L! For ENDURrun Rookies, this is one is a treat. Chicopee is not widely used as a running venue, but provides some breathtaking climbs and zippy single track. Congratulations to everyone who logged their first kilometres in this Stage. In 2006, Brad Cunningham lost the gold jersey at Stage 5 after winning the first 4. Bob Jackman would go on to win the event in what then fourth fastest time. Wednesday night is the tipping point of ENDURrun week. Halfway? Check. Post-race feast at dusk? Check. Off day tomorrow? Check. Rob and Robyn maintain gold jerseys? Check. (Full results) Good times were had by all? Check. And just when you’re feeling comfortable with the event, we hit you with 2019 registration. It opens at 12:00 a.m. on Thursday. We sincerely want runners to consider the early commitment. Get those training cycles in. Do back to back long runs. Do simulations. The common elements of successful training plans are motivation over time. Signing up now solves that equation. We can’t stress this enough, and that’s why we escalate the prices significantly. Be sure to join our ENDURrunners facebook group or ask someone who is for the $100 promo code. Until August 26th, get into ENDURrun 2019 for only $350. See you tomorrow for Stage 4.5, 1:00 p.m. at the Heuther. After 3 Stages, our leaders continue to defend their gold jerseys. Robert Brouillette, the three-time defending champion, is expected to repeat this year. (No person has ever won four consecutive years.) With a half hour lead over Aidan Rutherford so far, his main battles are his own previous times and those of Charles Bedley of 2003 and 2004 vintage. Today, Rob’s time was the second-fastest ever, for the first time beating the 2003 Charles. Rob looked in control today and his six lap splits were the most consistent of his four attempts. Congratulations! 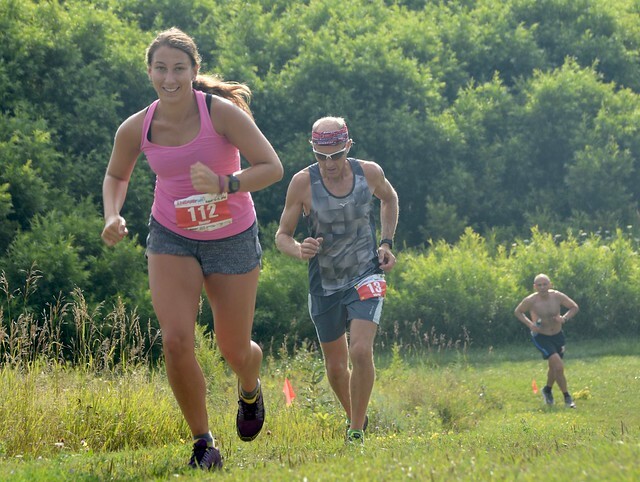  ENDURrun Ultimate 160K | stage 3/7 | Bechtel Park 30K XC | 1:55:47 | 1st OA | course PB | 2nd fastest all-time! Robyn Collins has looked good in gold in her Rookie campaign, winning the first three Stages outright. However, her lead after Stage 3, 2:01, is the lowest ever lead at this point (2:50 in 2008). Valery Hobson has finished second in each Stage and her final three laps today closed over 2 minutes to finish less than one minute back in Stage 3. And don’t forget 2017 Ultimate winner Vicki Zandbergen, sitting 15 minutes back with 93.9k remaining this week. Well done; this race is very exciting. H+P Men’s A continues to get it done, building their lead to over 29 minutes so far. This is the 3rd-fastest relay after 3 Stages ever. The H+P Women’s A team is the fastest-ever all-female team after Stage 3. Matt Tribe is tied to the second with Thaddeus Homewood, who is 10 seconds behind his own 2017 time. Rebecca Kruisselbrink is over 40 minutes ahead of her own 2017 time after Stage 3. Maureen Pecknold, Maria Michel, and Sara Blanchett are all within 63 seconds. Maria is a rookie, and Maureen and Sara have 12 combined finishes between them! 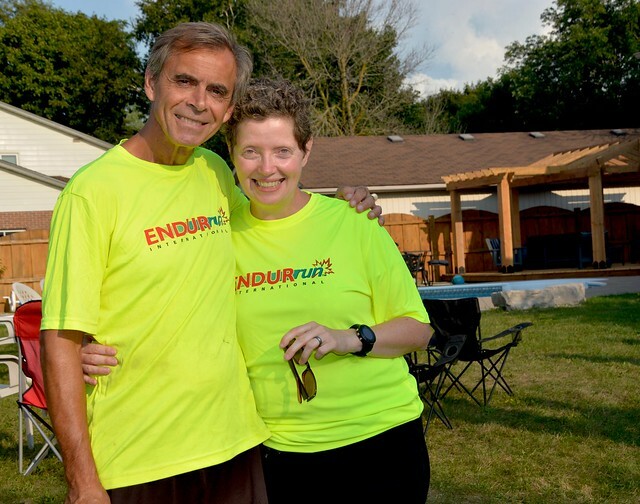 Also of note is that Jack Kilislian has run more ENDURrun Stages than any other person – . This is also his tenth Bechtel – 300k over the past decade! Posted 8:24 am by ENDURrun & filed under 2018. Our runners just took off on the first of six laps in today’s 30k cross country Stage 3. They will pass a 40k sign on their first loop, marking one quarter of the week, with about 26k of trail left. This is considered to be a “start” to the week, as the recovery adds up, the kilometres hit the trails, and the drama continues. With 70 athletes in the field recording six splits each, lots of data will be available and lots can change throughout the day. Here’s how to follow along. For the first time in 2018, we have a Live Stream from the finish line. With a six loop race, today’s video will be awesome. Check it out! These videos are also available after the race as well. As the week goes along, we want you to get to know the Run Waterloo Results website and all of it’s ENDURrun features. If you’re looking for race times, this is your spot. These results are easily filtered to show Ultimates only or Relays only. These pages also show links to photos and video, where available. – then use the search for “Wilf” to see how Wilf Goron’s eighth Ultimate is his second-fastest! Remember these default to Stage 1 and to Ultimates. If you want to see general records, such as Erin McClure’s fastest ever Stage 2 for any woman, adjust the filters to show all (Relays plus Guests). If you are reading this between 9:00 a.m. and 12:00 p.m. on Tuesday, check in with the live results to see split updates from the course. Posted 1:39 pm by ENDURrun & filed under 2018, Recaps. Except all your friends are here! As ENDURrun 2018 got off to a running start, it was a great mix of old and new. Ditto: For the fourth consecutive year, Stage 1 played out the same: on the men’s side, Rob Brouillette sets a large lead; on the women’s side, a new member (Robyn Collins) joins the Golden Club; and in the Relay division, H+P storms to a lead. Splash: One cool aspect of Stage 1 is that the race venue is close to RD Lloyd Schmidt’s home…and pool. As usual, runners gathered poolside for a refreshing conclusion to the morning. Yum: A gourmet feast of healthy and tasty food awaited runners at Conestogo Community Park. Watch: We live-streamed most of the race on our YouTube channel. Thanks everyone for watching, asking and answering questions, and keeping us talking! See you again tomorrow! Henry made his first public appearance during the race! Smile: Daily sneak peek albums from Julie. Here’s Stage 1. Thousands more photos will follow in the weeks ahead. Robert ran a solid 1:17:32 and Rookie Robyn took gold with a 1:29:21. Both athletes have earned the right to start last in tomorrow’s time trial 15k, which means they start 1 minute behind their closest rival. Stage 2 is a flat out-and-back course. H+P Men’s A took top place in the Relay category with Brendan Hancock’s top performance. H+P had had the top 2 Relay teams after Stage 1 in each of the past 4 years. Interesting note: Mike Tickner set an all-time Stage 1 Guest record today with 1:20:50. Congrats! The women’s race was the most unpredictable of all. Gold jersey bearer Vicki Zandbergen finished fourth behind strong Rookie performances from Robyn and Lisa Leskien, and Valery Hobson who took 3 minutes off her 2017 time. For Men’s 2nd Place, Rookies Aidan Rutherford and Dave Harmsworth came through the split with 2017 second place Nick Burt, and in the end, Dave took 2nd and Aidan 3rd. Ian Grzegorczyk took over 6 minutes off his 2017 time. Rebecca Kruisselbrink took off almost 15 minutes off her previous Stage 1 best in 2016! Wilf Goron continues his epic comeback, taking over 22 minutes off his 2017 time, which was 40 minutes faster than his 2016 time! Is that even possible? Also notable: Chris Battaglia pulled out a huge sprint to duck in 7 seconds under the cutoff! Glad to keep you in the field! Barely a tenth of the way through this week’s mileage, runners have an opportunity to rest before the looming 15k Time Trial. The slist will be posted later this afternoon, but check out the 2017 start list for your own reference. Posted 11:33 pm by ENDURrun & filed under 2018. About half of the crowd are Run Waterloo regulars who run this town. Half are guests from all over, many of whom we don’t see for up to 11 months at a time. And whether they are new faces or old, old or young, the one thing in common is the sense of community kept apart for too long. One last thing: if you are looking for ENDURrun photos, head over to our Flickr page. They will also be embedded directly into the results as they come in. See you bright and early in Conestogo tomorrow morning for Stage 1. There will be a live stream and live results.